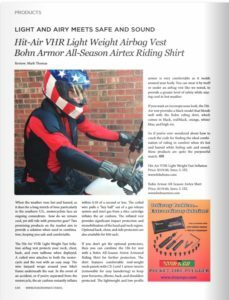 Thank you to Mark Thomas for the great review this month in ROADRUNNER magazine of our All-Season Airtex Armored Riding Shirt in red. When the weather runs hot and humid, as it does for a long stretch of time particularly in the southern U.S. Motorcyclists face an ongoing conundrum-how do we remain cool, yet still ride with protective gear? Two promising products on the market aim to provide a solution when used in combination, keeping you safe and comfortable. To read more, check out the latest Road Runner Magazine at your local newsstands. 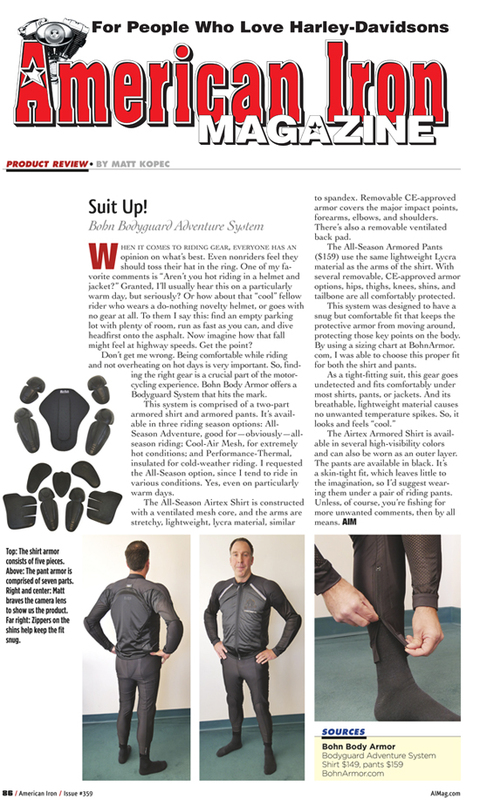 Thank you to American Iron Magazine and Matt Kopec for the fantastic review of our All-Season Airtex shirt and All-Season Adventure pants. When it comes to riding gear, everyone has an opinion on what’s best. Even non-riders feel they should toss their hat in the ring. One of my favorite comments is “Aren’t you hot riding in a helmet and jacket?” Granted, I’ll usually hear this on a particularly warm day, but seriously? Or how about that “cool” fellow rider who wears a do-nothing novelty helmet, or goes with no gear at all. To them I say this: and an empty parking lot with plenty of room, run as fast as you can, and dive head first onto the asphalt. Now imagine how that fall might feel at highway speeds. Get the point? Don’t get me wrong. Being comfortable while riding and not overheating on hot days is very important. So, finding the right gear is a crucial part of the motor-cycling experience. Bohn Body Armor offers a Bodyguard System that hits the mark. This system is comprised of a two-part armored shirt and armored pants. It’s available in three riding season options: All-Season Adventure, good for—obviously—all- season riding; Cool-Air Mesh, for extremely hot conditions; and Performance-Thermal, insulated for cold-weather riding. I requested the All-Season option, since I tend to ride in various conditions. Yes, even on particularly warm days.